This book series is lots of fun for students around third grade level. The main characters in the book are: Eddie, Melody, Liza and Howie and they seem to always take the boredom out of a regular school day. In each book a new adult arrives and a new predicament develops. The adult could be a new janitor, a substitute teacher or, in this case, the new cook in the cafeteria. These books can be used as a book that you read to the class or, if you have multiple copies, the students can participate in the oral reading. Using white construction paper and a pattern, trace 2 big hearts for the front and back covers of a booklet. Inside, staple six pieces of writing paper, also cut in the same heart shape. As you read each chapter or two, follow-up by having students answer the following questions in complete sentences inside their own individual booklets. Students will put their names on the back of the booklet. 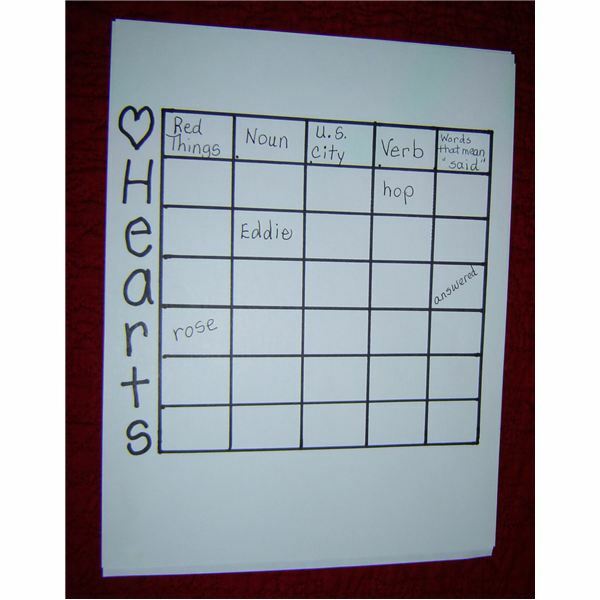 Write one name on each heart using the names of the characters in the book: Eddie, Carey, Melody, Liza, Howie (write his name on two hearts), Mrs. Jeepers, Principal Davis, Ben, Issy, you and me. Place the hearts face down in the center of two teams of students. The object of the game is to match two characters that fell in love with each other when they ate the special cookies. Each team takes turns trying to find a match. The team with more matches wins. Matches are: Eddie + Carey, Principal Davis + Mrs. Jeepers, Melody + Howie, Liza + Howie, Ben + Issy, You + Me. Review the categories and remind students of the meaning of verb and noun. Think of a word in each category that begins with the letter at the beginning of each row. For example: Letter A for “words that mean said” could be answered. This Book Will Win Your Heart! The Bailey School Kids always manage to add excitement to every school day. In this case, when the students are smitten by the love bug they think the new cafeteria cook is really Cupid. Students will enjoy the book and the follow-up activities. They will also work on goals such as identifying nouns and verbs and answering comprehension questions in complete sentences.